Apparently, our eloquent governor is going to veto our budget and send our state into a shutdown because he swore no new taxes, dammit. But where will those taxes be coming from? Here, courtesy of the US Census American FactFinder, are some details about where our Accommodations and Food Services revenue is concentrated. The first map is at the county level, detailing revenue from 2010. The second includes some municipalities, and it represents data from 2007. Touristed areas in Southern Maine — and especially Portland — are driving the states accommodations and meals revenues. 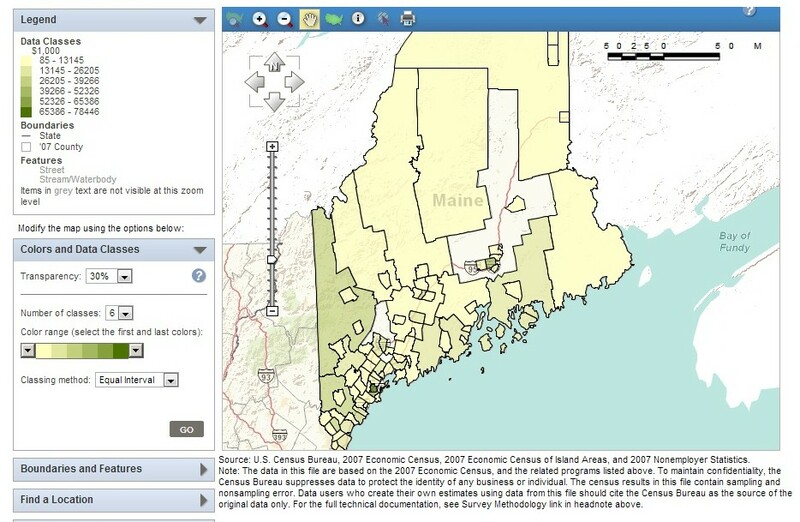 Most places in Maine, unfortunately, have very little meals and accommodations revenue compared to those places. This increase will not affect them very much. Meanwhile, remember those $400 million work of 2011 income tax reductions that got us into the present mess? Where did the largest pieces of that tax cut go? Again, thanks to the American FactFinder (thank you, US Census!) we can see where households making over $200,000 are clustered. 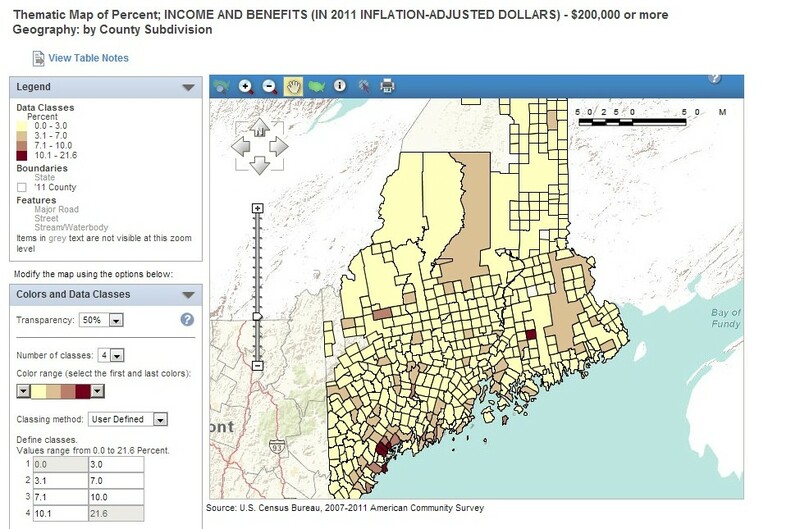 The following map shows municipal-level descriptions of the percentage of households with incomes over $200,000. Aside from that one unusual place up in Hancock County, you can again see that the Portland area figures most heavily in the picture. Places where people are just about to enjoy a sizable income tax cut can probably afford to throw another penny on the dollar into the state kitty when they go out to eat. The fact that the governor’s stance is entirely ideological and unmoored from any sense of pragmatic, empirical reality is driven home by the fact that Maine is presently among the states with the lowest sales tax of any nationally. Even his beloved New Hampshire sees the good sense of taxing meals and accommodations – except their rate is 9%, while our budget sees us moving only to 8%. Meanwhile, the pain of what will happen in all of the less-wealthy towns across Maine if the governor gets his way on the budget will dwarf the taxation experience those towns will have of a 1% meals and accommodations tax and .5% sales tax increase. East Millinocket’s already importing students from China and sending out property tax bills early to keep their schools open. What are the rest of them going to do? This entry was posted in Maine Economy, Maine Legislature, Municipal Finance, Two Maines, Uncategorized. Bookmark the permalink.